People often ask what we have on our walls. The simple answer is: A Lot. But the longer answer is: art, photos and objects that combined tell the story of who we were, who we are right now and what’s important to us. But we’re just as guilty as most folks, sometimes it takes a while to get something framed and up on the wall. We recently painted at home and used the opportunity to frame some things we’ve collected since opening Anthology, three years ago. 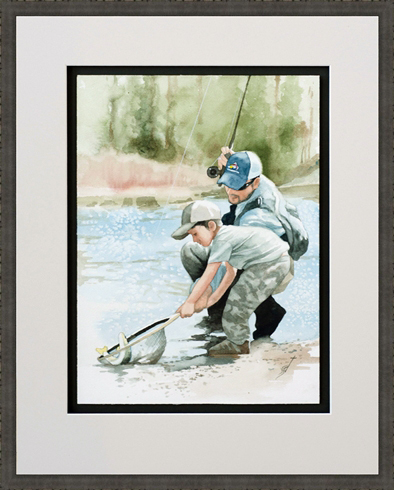 This watercolor is from a photo I took years ago of Zach and Gunnison fishing. It was then painted by a very talented friend, Seth Weber. Seth did an amazing job with this watercolor and painted to the very edge of the paper. Not wanting to lose any image, it was framed as a raised float on a Crescent mat with a second raised mat and 3/8 inch reveal. The frame is from Larson Juhl’s Lisbon Collection and finished with UV blocking glass. I love this painting even more than the photo, but it still took over a year to get it back home and hung. Art bought on vacation, a painting your child created in high school, or even an old family photo are worth finding and preserving with custom framing. Now that the watercolor is hanging, I enjoy it everyday and it immediately takes me back to the beautiful afternoon we spent on the South Platte River.